I just wanted to let you know how impressed I was with the delivery of the cable I ordered. It really came by express post, and it really did arrive the next day. No rushing to a store to pay double for the same cable. Loved the minties too. Will definitely use you a third time and I've referred all my mates to buy cables and LCD brackets from you! Convert your Mini-DisplayPort DP++ or Thunderbolt Socket to work with VGA! 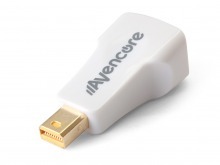 Avencore's incredible Mini-DisplayPort to VGA has what it takes to make your life easy! Converts from a Mini-DisplayPort (DP++) source device to a VGA female socket, for connection to a VGA Monitor, TV or Projector (one way only). Supports Thunderbolt source devices. VGA signals up to 1920x1200 including 1080p Full HD are supported from almost all modern Mini-DisplayPort source devices, including Laptops, Personal Computers and even Thunderbolt-ready Macbooks and other Apple computers. DisplayPort does all the work with the DP++ 'Dual Mode' hardware, leaving this passive adapter to simply change the socket types for you. That makes it compact, portable and easy to use. Check your manual or look for the D++ logo on your source device to make sure your equipment has the ability to give you VGA compliance. Then, simply plug it into your Mini-DisplayPort source device, and connect up the display with your existing VGA cable. Both 14-pin and 15-pin VGA cables are compatible, but if you need a spare we stock a range of VGA cable lengths. DisplayPort (DP) adapters require a DP output which is DP++ (Dual Mode) compatible. When a DisplayPort to VGA adapter is connected to a DP++ (Dual-Mode) output, the output device senses the presence of the adaptor and performs an active signal conversion from DisplayPort to VGA. This adaptor is not bi-directional, and does not convert VGA to DisplayPort.